This was my second consecutive year as an attendee and I used the knowledge gained from last year’s somewhat overwhelming first-timer experience, to plan and choose my sessions wisely, and also to fully embrace the plethora of Fest networking opportunities. Now that I’ve had time to reflect on the key thoughts that filled the air at Fest, I’ve come away with my top 10 list of key Fest insights. Change & Transformation. Beginning with Relativity CEO Andrew Sieja’s keynote that mentioned the “reimagining” of ediscovery more times than I can count, and pervading the days filled with panels, workshops, and hands-on labs, the theme of change and transformation in our evolving industry was intricately woven throughout Fest, particularly due to the continual emergence of new technologies and new data sources. Data Management. Throughout the sessions, it was apparent that the ediscovery landscape is transforming outside of traditional civil litigation and moving toward a more comprehensive “data management” approach. 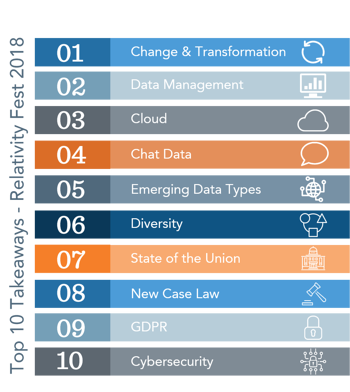 The focus is turning to broader ideas around legal data management and what else the industry can tackle with all of the ESI we collect, review, and produce. Cloud. During the keynote address, Andrew Sieja proclaimed that the new era of ediscovery is SaaS. “The broad adoption of SaaS platforms will free up the intellectual energy of a lot of people in our industry,” Sieja said. With the Cloud here to stay, ediscovery is becoming simpler, less expensive, and more secure. Chat Data. Sieja also focused on the importance of Relativity integration with popular messaging tools, i.e. Yammer, Slack, text messages, and how these new data types have been difficult to handle (and often ignored), but are now a natural place of focus for development teams. Emerging Data Types. During one of my favorite sessions, The Internet of Things from a Legal, Regulatory, and Technical Perspective, ESI Special Master Craig Ball asked, “Data offers answers and mobile is the ultimate IoT device...if you’re not dealing with mobile and IoT in discovery, why not?” As new data types emerge and become more complex, the obligations to discover this data will only increase. Diversity. The topic of diversity was everywhere at this year’s Fest, including the important lack of access to justice issues. On the diversity front, the legal profession was continually cited as falling behind as it remains the least diverse profession in the US, despite the fact that women now outnumber men in law school. New Case Law. Always a highlight of Fest, the annual Judicial Panel featuring four judges and four cases, did not disappoint. The SCOTUS ruling with far reaching ediscovery and privacy implications, Carpenter v US, held the most intrigue. The Court ruled that the government’s acquisition of cell phone location data constitutes a search under the Fourth Amendment, creating a broad range of consequences for privacy, especially with the increased use of mobile devices. GDPR. At the International eDiscovery and Data Protection session, panelists presented the GDPR as an opportunity, rather than a burden for ediscovery. In particular, the GDPR was highlighted as a way to expand the ediscovery workflow to include privacy obligations. Clients are embracing GDPR compliance, and opportunities for Legal and IT to collaborate are expanding. Cybersecurity. Challenges around data security are facing everyone and establishing best practices to ensure security has become mandatory for law firm and vendors. In the Who’s Abusing Your Data Today session, experts tackled this much discussed issue with tips for avoiding data breaches and ways to use technology to comply with privacy regulations. In the spirit of collaboration, consider sharing these takeaways with your team as you develop your future ediscovery plans. Sieja summed it up best in his closing keynote statement, “Together, this community, we can reimagine the future of ediscovery.” If you have questions or would like to discuss this year’s Relativity Fest further, please reach out to me at SLedgerwood@lighthouseglobal.com.